As the remaining provisions of the Affordable Care Act are phased in over the next several years, the American health care system may be forced to rethink how health insurance is written and delivered in this country. The United States is unique among industrialized Western nations in that most of its citizens obtain coverage from the private market, primarily from their employers. According to recent statistics, 58% of working Americans under the age of 65 get their health insurance through their employers. While this percentage has steadily decreased over the past several years, a majority of working-age Americans still rely on their employers for insurance, a trend that has persisted for decades. A quick lesson in history can explain why this is the case. While health insurance policies first made their appearance in the United States during the early 20th century, World War II saw a dramatic rise in employer-sponsored health care plans. This is because wage and price freezes were put in place to tightly regulate the American wartime economy, making it difficult for businesses to attract new workers to replace those who had gone off to war. However, fringe benefits (such as sick leave and employer-sponsored health insurance) were not subject to wage freezing, allowing employers to offer these additional benefits in lieu of additional pay. This system allowed for 75% of Americans to have some form of health insurance by 1958. 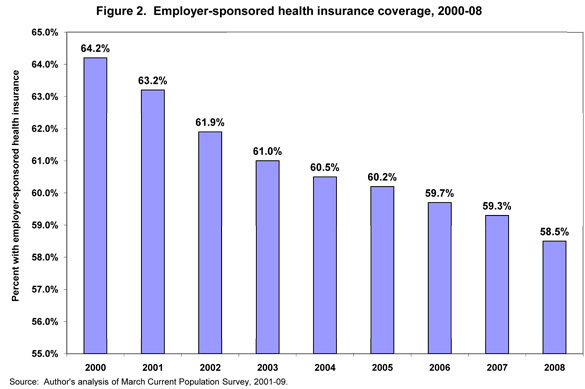 For better or worse, the trend of obtaining health insurance as an employment benefit has persisted to present day. While this system is often lauded as a motivator for Americans to find and keep employment, it does nothing to address the needs of those who are unable to work – namely, the sick and elderly. Even poor Americans who are able to work either cannot obtain insurance through an employer, or are required to contribute toward group insurance premiums (which can be quite high for those with chronic health conditions). The Affordable Care Act (ACA) was designed to address many of these concerns. For example, by this time next year American health insurers will be prohibited from denying coverage or charging higher rates for individuals based solely on their preexisting conditions. In addition, employers who do not offer health insurance to full-time employees will be forced to contribute more in taxes, which will be used to fund a health insurance pool for high-risk Americans who cannot obtain coverage in the normal market. However, the implementation of health insurance exchanges over the next several years could wind up having the biggest impact on the health care market. As previously discussed on this blog, a health insurance exchange is a marketplace operated by state governments where individuals can compare private insurance plans and purchase their ideal coverage. The Congressional Budget Office, a non-partisan federal agency that researches economic data, estimates that 7 million Americans will participate in the exchanges when they first become available in 2014, and as many as 24 million will participate by 2016. These figures are important because the CBO also predicts that the increase in Americans obtaining insurance through health care exchanges will contribute to a decrease in those who obtain coverage through their employers. 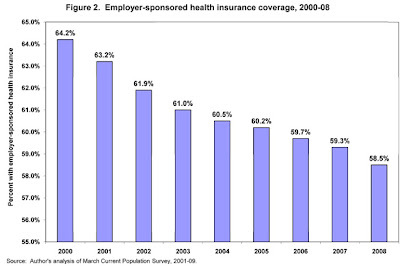 The percentage of Americans with employer-based coverage has steadily decreased over the last decade, as employers are beginning to treat health insurance as a costly burden which they’d rather do without. Since 2000, many businesses have cut health care costs by reclassifying employees so they are no longer considered “full-time,” reducing hours, and laying off employees outright. Companies like Papa John’s Pizza have publicly lamented the headaches and overhead associated with providing health care to employees, with some even turning to offering money to employees to shop for coverage on their own. Those who find it difficult or even impossible to obtain coverage through employers are prime candidates for the new health care exchanges, where they might find themselves eligible for federal subsidies if they participate. So while this likely would not take place for several more decades, these estimates suggest that the number of people who obtain health insurance through an exchange could rival, if not surpass the number who obtain coverage through their employers. Should this be the case, it could very well transform the private insurance market from an antiquated model established to meet the needs of a wartime economy some 75 years ago.